Of course the (toad) licking myth is newspaper hype – it is the venom that is active, and it is smoked. 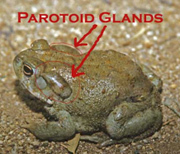 While anthropologist Peter Furst places the use of Bufo toad venom “all the way back to Neanderthal Man” one hundred thousand years ago, and we can say with confidence that Bufo toads and Man have been in close contact from the first day we irrigated a field, there is no evidence that anyone smoked Bufo alvarius toad venom before some time in the 1970’s. (Bufo alvarius toad venom was found to contain 5-MeO-DMT in 1965; the paper containing that fact was published in 1967). 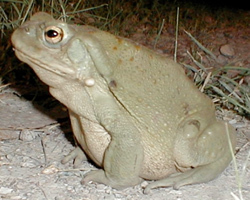 There are over 285 types of Bufo toad world-wide, but only one – the Bufo alvarius or Sonoran Desert Toad – is known to have 5-MeO-DMT (up to 15% by volume) in its venom. Toad venom smokers ‘milk’ live Bufo alvarius toads of their venom by stroking the areas around their paratoid glands which causes the toad to excrete its venom. This venom is caught on a piece of glass or mirror and left to dry into a crystal-type form which can be smoked. In 1984, the first widely distributed description of smoking Bufo alvarius toad-venom for its 5-MeO-DMT content came in the form of an extraordinary pamphlet titled “Bufo Alvarius: The Psychedelic Toad of the Sonoran Desert by Albert Most (Venom Press, Denton, Texas). No doubt thanks to enthusiastic descriptions such as this one Albert Most’s pamphlet was popular underground reading (non-pun intended!) through out the Sonoran Desert region. Most and his friends even formed an informal “Church of the Toad of Light” that was never officially incorporated, and a small but enthusiastic population of Bufo alvarius toad-venom smokers has undoubtedly existed since this time. Dried Bufo alvarius venom was occasionally sold on the underground market as ‘organic DMT’ venom, and has been reported from Los Angeles to Germany! Whether or not this small south-western underground culture of Bufo alvarius toad-venom smoking had anything to do with the birth of the urban myth of Cane toad licking the much more common Bufo marinus toad is impossible to say, since there seems to be no basis to that the myth, and the few unfortunate youths who have been foolish enough to lick cane toads have done so because they have read reports of it in the media. This confusion between the common Bufo marinus and the much rarer though very physically similar Bufo alvarius toad may however have a fascinating historical precedent. 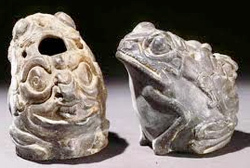 In the 1992, ethnobotanist Wade Davis and Andrew Weil published a paper on the in Ancient Mesoamerica (1992) titled Identity of a New World Psychoactive Toad that provides a convincing argument (based on the potency of the venom and pre-existence of Ute-Aztec trade routes) that the toad so venerated by the central Mesoamerican cultures (Olmec, Mayan, and Aztec) was in fact not the Bufo marinus as common believed by anthropologists, but actually the physically similar Bufo alvarius from the Sonoran Desert whose venom contains 5-MeO-DMT. We repeated the experiment with a sample of venom collected two years earlier in Gila County, Arizona. This material had been kept in a closed vial at room temperature. It had darkened over time but was quite active. Last summer I took a sacrament I think the literature refers to as ‘toad slime’. In this particular experience – it’s a nine minute, uh, moment; I’ve taken it several times – I turned into a very large black woman. I was surrounded by beings who were children – all suffering, hungry, frightened, sick. I found myself opening my arms to draw them all into myself. At the same time I was both gagging on it all, and in absolute ecstasy, the ecstasy of just being part of the total dance of life, not looking away from anything. 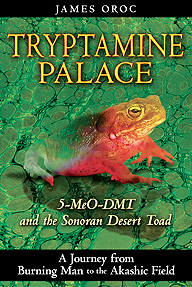 My own misadventures in toading are recorded within the pages of my book Tryptamine Palace which has an entire chapter dedicated to the Sonoran Desert toad. However what was probably my finest experience of smoking toad venom does not come from that chapter, and was supposed to be the very end of the book. Picking up the glass bowl and looking at its contents in curiosity, the scientist in me noticed that the venom had blackened and re-solidified in a hard layer across the top of the bowl. The hog in me saw that there was still plenty left. I felt so grateful for the experience I had just had, I wanted to share the venom with some people I loved; it seemed wrong to hold onto it all for myself. But I knew there was more in the freezer, and I rationalized that I had probably taken most of the 5-MeO-DMT in the venom with the first hit, so the second hit should inevitably be milder. Nevertheless, I was grinning when I raised the pipe back up to my lips, still high from the first pipe, and the little voice in my head said, “Greedy, greedy,” as I sucked in with a strong and steady draw. The effect was obvious immediately, even before I exhaled my breath in a short stunned gasp that contained no smoke. It was just like the 5-MeO-DMT trip report from TIHKAL that I quoted in the Introduction, which says, “The entire universe imploded through my consciousness.” That is as good a way of describing it as any. Everything I have tried to say in this book (and an incalculable amount of other things) all happened simultaneously in a cosmic flash of pure insight. I went through the all the different levels that I have described in this book as One, moving through a timeless reality in a manner impossible to describe. I saw the teeming multitudes, I heard dogs barking and children playing, and I expanded out beyond the stars—all the while fearless and at peace, cocooned in a field of immeasurable love. Pure love—there is no other way to describe it. It was the same love I had found my first time, the same love that had come when I had asked it to name itself; it was the love that had been missing during my last few experiences, replaced by that awesome power. Yet I knew the love and the power were the same. Their tangled braid represented the creation principle of the universe and beyond, from the infinite emanation of forms, to the form-without-form that I can only call G/d. That mighty love drew me up and pulled me in. Lost in that moment outside of time, I knew that Love was me, and my wife, and my friends, and my dog Koda who had died. Love was M.O.M.’s Ball and Burning Man. Love was this life we were all blessed with, this planet, this galaxy. Love created all of it, since Love is the creation principle. Love is All. It makes everything possible and ultimately guides the universe in some mysterious unknowable way, and if the Light is the energy of God, then the Love is God’s plan. In the introduction to Alex Grey’s book “Sacred Mirrors”, Alyson Grey relates a shared-psychedelic experience between the two artists had that would shape both their personal and artistic futures. I exist! With G/d. This is real! This is reality. And for a single eternal moment outside of time, G/d and I were one. The Light of lights, the most sublime cosmic love and intelligence; Consciousness recognized as the beginning and the end of everything. Two things made this toad venom experience unique: the “softness” of the experience (with an almost total lack of fear), and the fact that the entire time I had been partially aware that I was still sitting in my armchair. My separate consciousness was somehow able to resonate with what I consider an “ultimate” 5-MeO-DMT experience (the union with G/d), and yet bizarrely at the same time still be cognizant of my physical existence. At the point when my mind actually fully opened up to a union-with-G/d, I think I did lose contact with this physical reality (and more time passed than I realized, probably around ten minutes). And at one point I remember abruptly coming out of the experience—without the usual disorientation that accompanies the come-down of a 5MDE—and seeing my hands on my knees and the surroundings around me. I was still dislocated in time and wondering what was going on, unable to recall any past. Then I realized exactly what had happened, as I tried to hold onto the last fleeting moments of the light and the love. Three years after my initiation, this was undoubtedly the most beautiful 5-MeO-DMT experience that I have ever had. Laughing with the sheer exhilarating joy of it, I collapsed out of the chair and lay spread-eagle on the floor. ~ James Oroc, Tryptamine Palace. (2009). As an experiment (and in a foreign land) I smoked the last of the Bufo alvarius venom (the story of whose collection is described within the pages of Tryptamine Palace) with some ‘regular’ DMT (extracted from Jurema Preta.). 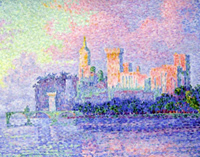 In the vast majority of my early nigerine (DMT) experiences, I encountered visual fields of ‘dots’ that would come together to form images, much like the pointillism style of painting developed by Georges Seurat or the Australian Aboriginal song-line paintings. With the addition of the 5-MeO-DMT containing toad-venom to the DMT however, the visual characteristic was completely different and totally unique to my experiences so far. 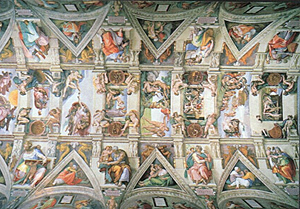 On this occasion there was a complete lack of ‘dots’ or ‘points’ of any kind, the fine lines of the constantly changing imagery were like those painted with a single-hair brush on Tibetan thangkas and due to the overwhelming artistry of what I was seeing, I could only think of the vaulted ceiling of the Sistine Chapel in comparison. This was without a doubt the most ‘visionary’ experience I have ever been fortunate enough to encounter and I lay there with my eyes shut watching the most fantastic parade of the Collective Unconsciousness imaginable, wishing that it would never end, and as I sit here now I can not even describe one tiny corner of it, since every image in the multitude of imagery was in such constant motion that they defied all but a glimpse. And then moments later, like a tent collapsing when its ropes are cut, the vision is gone. Leaving only a struggle of words to explain it, since nothing before or after has come close to this experiences visual majesty. And finally, no section on psychedelic experiences would be complete without raiding the ERWOID vaults. 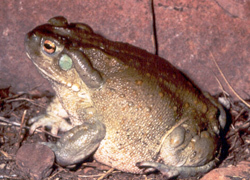 The following account of smoking Bufo alvarius toad venom comes from 2003. It was monsoon season in Tucson Az. I prepared my mind for clairvoyance. I treated the toads with the utmost respect, individually asking each for the proper spiritual permission to extract their precious defense mechanism. I ended up extracting the venom from primarily the two head glands of about 20 separate individuals. After partially drying the poison out (a required step to avoid growing mold/mildew/?) I separated what I had into many small 1mm3 chunks with a razor blade and allowed them to fully air dry. I returned to my porch and the awesome vista of the precious catalina mountain range. Some days passed, as I was waiting for the right time for my experience. It had rained all day long one day, something that we desert dwellers hold ever so dear, and by the late afternoon it began to calm down. With a slight sprinkle, not enough to see unless one pays special attention to the droplets on the ground, the sky began to open up and from above shot magnificent bolts of lightning. They fell sporadically, some atop the mountains, some as close as a mile. I knew this was the time. I was at no time in any hurry to do anything. I patiently retrieved my 'aroma oil incense burner' (vaporizer/crackpipe), my jet lighter (highly recommended), and my bufo. I relaxed, observed the mountains, and deeply inhaled the refreshing creosote air (the creosote bush, zygophyllaceae, releases oils during the rains, giving the air an authentic and beautifully fragrant odor). I prepared the pipe and rested it in my lap, briefly reflecting upon what I was about to feel (I had smoked this before, but not at the dose I had intended this time). I reflected upon my existence, strived for a sense of some bigger picture, and visualized the earth rotating around the sun, around the galaxy, and beyond. I pondered the sun's rays mutating into plants, into life, and as the lightning continued to strike the ground, I questioned the energy of the world and the goings on inside my body. This, I felt, had prepared me enough for what was about to occur. The next step was to ignite the engines. As soon as I noticed the little brown square beginning to vaporize, I started to slowly inhale. Slowly (I didn't want to have the chunk fly up into your mouth). Once it was melted to the glass, I inhaled deeper and harder. I thought I had enough, and then I had some more. A lot. My goal was to finish of the nuglette (which I instead turned into black resin at the bottom of the glass). I stopped inhalation and set the pipe down on the granite table (watch out its hot and can melt plastic). The feeling came on immediately and was overwhelming. I looked beyond my porch at the ground which looked like it was boiling (from the sprinkling). Then the entire world started spinning. I grew slightly nauseous (lots of different sensations all over), and was overwhelmed with an uncomfortable feeling. I could no longer keep my eyes open because the light and exterior stimuli were too intense. I reminded myself that this feeling was temporary and that pain and discomfort are transitory. I seemed to sky rocket exponentially, and soon I was too far beyond my own body to feel anything. It was at this time that I realized I was tripping HARD. The most intense trip I ever had. Until then i hadn't even realized what tripping was. I avoided panic by reminding myself that it wasnt going to last a long time, and that in this moment I exist, this moment is my life. Then it got about 10 times more intense. My closed eyes were seeing bodies of ungulating emanating infintesimal fibres of existence (no other way to describe). I no longer had a body, I no longer lived on earth, I no longer existed in this dimension. I was completely aware of everything that was going on, I had no memory lapse or anything, and yet I was ungulating along with this fibrous liquid. I realized that all these rules we have for living, all these behaviors we exhibit are products of necessity, and that I had no rules, I just existed. My mind began turning itself inside out over the question, 'I exist'. I felt so distant and yet so unified. Now I realize that language plays a pivotal role in thought processes and memory. We can not grasp existence because we have no means to describe it, to analyze it, to dissect it. But in a state of mind such as this, analysis is futile, thought occurs, and people, things, exist. also lost in the 'coming down'. encompassing liquid (not to mention the colors, oh god the colors!) I began to step back into 'reality' (which has since then meant something completely different). I watched the mountains rolling in waves in the distant, I watch the lightning get closer and further, and I was at peace with wherever, whenever, whatever I was.